On Thursday morning, most met at Flying J’s in Haw River. Around 9:20 we headed north. The drive was fairly smooth. 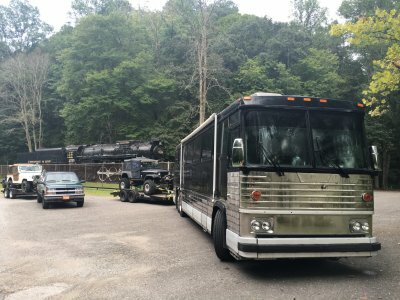 We stopped in Princeton, WV to fuel the rigs and our bellies. Then, we made our way to Logan, WV. We set up camp at the Chief Logan State Park. This is a really nice campground. Full hookup, pool, water slide, putt-putt, museum, etc. That evening, everyone chipped in and we had some hamburgers and hotdogs. Carl was messing with his bronco. I think he ended up replacing the alternator, regulator and rectifier. 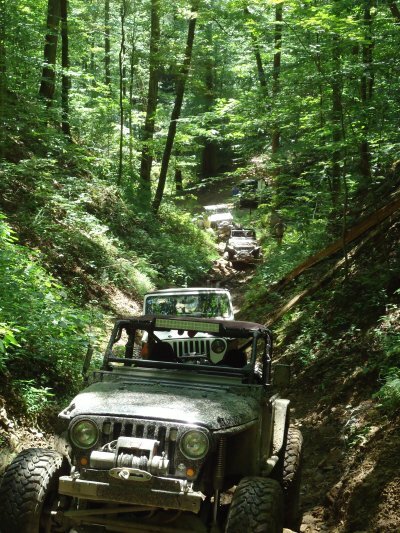 Everyone was pumped for the wheeling the next day. Friday we all headed towards the trailhead around 8:30. We got our permit and headed out as one big group. 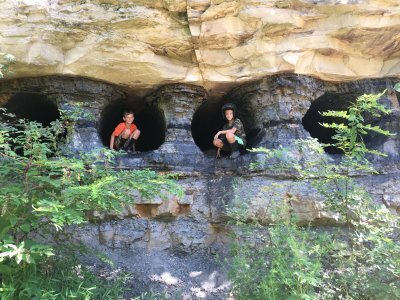 We wanted to get some miles and see what this park had to offer. We figured some blues and blacks would be good to get us warmed up. We went up 12 to 41 to 16 all the way over to 32 and 83- first black. The Blues were smooth sailing. The Blacks- had some steepness to them. However, they were not overly technical. By the time we finished 83 it was lunch time. The group decided at that time that we would break up into two groups- moderate and extreme. The Extreme group headed over to the Black/Red trails (44, 45). Trail 44 was tight. This is a new trail system and you could tell it on these trails. 46 was blocked at one end by a tree so we headed over to 93. That one was blocked by a tree as well. We headed to 88. Once, we got through most of the technical stuff- John’s Toyota went wonky. His front axle was way off to the side- not centered under the vehicle at all. We discovered that the front-upper control arm mount on the frame ripped off. 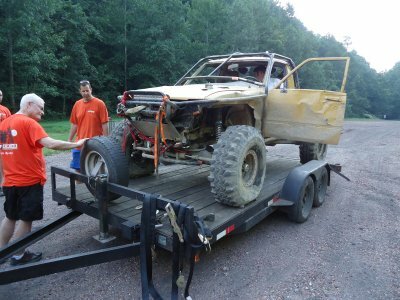 The team quickly stabilized the yota and got the axle centered with some winches. Scott went off to scout to see if it was best to continue forward or turn around. 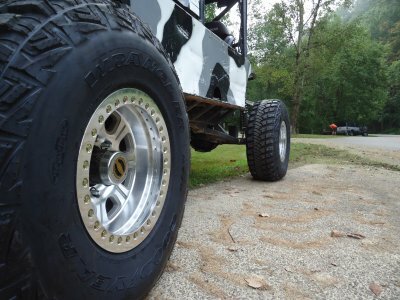 The recovery team used ratchet straps to keep the axle centered under the vehicle. The quickest route was to continue forward. 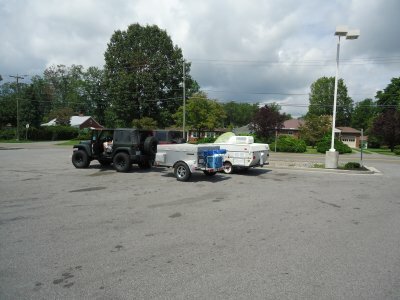 Scott went back to camp to get John’s truck/trailer while the recovery team got John off the trail system. The ratchet straps worked great. 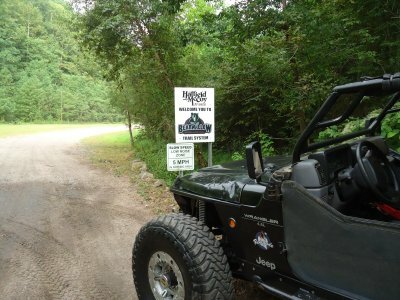 They got back to the Trailhead before Scott got back with the truck and trailer. 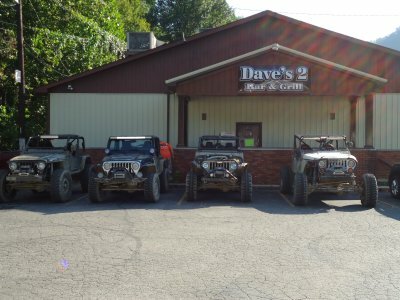 We decided to call it a day and headed to Daves 2 for some relaxation. That evening, we headed back to camp and got cleaned up. On the menu was pizza pockets andouille sausage over the fire. Can’t beat that after a day on the trail. 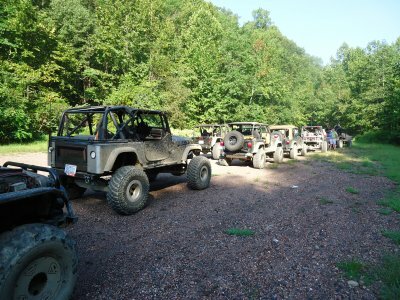 Saturday we started out as two groups but all went to the Trailhead. However, David Holmes decided to go to a different trail system. It took the moderate group about an hour to track him down. The Extreme group went straight to trail 46. We knew it was blocked at one end by a huge tree. However, the trail looked good enough to drive down and back. We are so glad we did. This trail had everything. Steep drops, big rocks, water, steep climbs, off camber, moss, mud. We made our way down fairly smoothly. 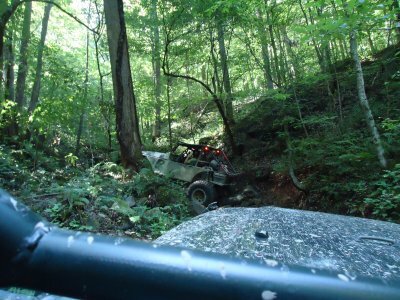 Then, on the way back up- Craig’s jeep started having an issue of staying running. At idle, it would just die. After playing around trying to get it to run right- David Hendrickson suggested that he turn on the AC- this tricked the engine into raising the idle speed. Worked great. Back up the trail was a good waterfall obstacle. Scott one shotted it. Dusty gave it a couple tries before eventually making it. Randal made easy work of it. Craig worked hard but had to winch up. The rest of the trail was a lot of bumping and driving by feel to get to the top. Randal got a little tipsy at one point and we put a winch on his cage to keep him on all fours. Eventually, everyone made it to the top and we ate lunch. After lunch, we went over to trail 91. That trail was a lot of fun. then to 94- this trail had a huge rock right in the middle that gave everyone a hard time. Craig’s rear locker was working intermittently. Everyone had to winch over that one. Craig decided that would be his last hard-core trail. We then went to 80. This was a fun trail. We ran it up hill there were several different off shoots that I imagine will turn into trails into the near future. 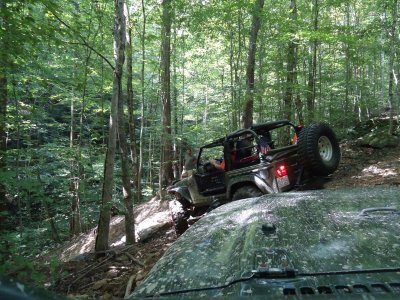 Randal, Scott and Dusty all had a blast making it through this trail. After this trail, it was getting late- so we met up with some of the guys at Daves 2 again to relax and tell some lies about the day. On the way back to camp, a car wash was spotted. Most members stopped in to wash off their vehicle. It is always easier to clean up the trail rig with a pressure washer soon rather than wait a couple days and do it at home with a normal hose. On to camprgound for a quick shower. Most members headed into town for some dinner at LaHacienda. It was your typical mexican food- good and fast. We ended the night with gathering around the campfire talking about the events of the day. Sunday, we cleaned up and hit the road. 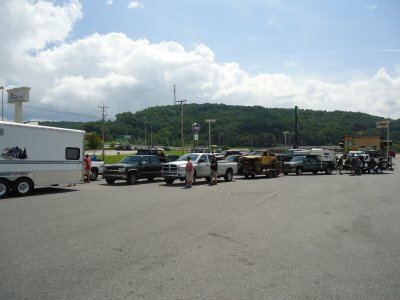 There were several differnet groups however, many met up at the Flying J in Whytheville for lunch at the Wendys. The ride home was smooth for most. Randal did have some coolant leak issue and had to refill his radiator several times but did make it home under his own power. Bearwallow- definitely a place to go back to again. It is not really a place that you can crawl. The trails are shaded so they may be wet or have moss- a little bump is usually needed when it gets a little difficult.